The first 15 feet of the Stile Ranch trail. Parks like Edgewood, and Russian Ridge get a lot of credit for being spring wildflower hot spots but quietly this small south bay trail sports one of the densest and brightest displays of native California flowers with a tremendous diversity of plant life to boot. The winding trail treats a hiker to surprisingly grand views of the Sierra Azul (south Santa Cruz mountains) with Loma Prieta and Mt.Umunhum quietly looming across the valley below. In the spring the temperatures are low, and the trails are quiet. It's does not offer the same getaway that other parks offer, but it is within a 20 minutes of Almaden, Morgan Hill, and Santa Teresa. 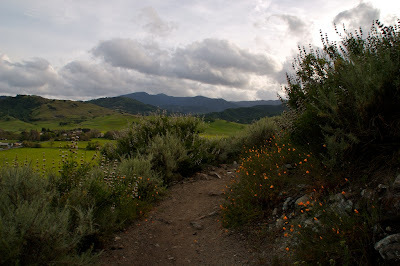 Switchbacks going up the first mile of the Stile Ranch trail offer fantastic views of the Sierra Azul. From the Fortini Road entrance the Stile Ranch trail climbs quickly up the the serpentine hills. 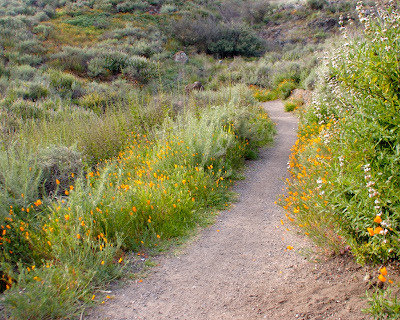 The sides of the trail are immediately ablaze with California golden poppies and Goldfields. A sharp eye might catch Jewelflowers and tidytips swaying in the winds. Tall grasses line the slopes near the top broken only by a few lonely trees and the occasional rocky outcropping. 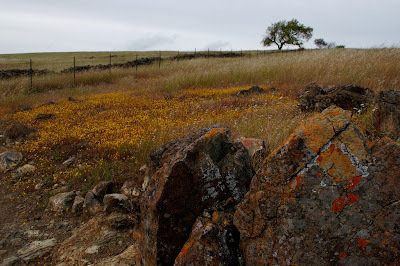 Rocky outcroppings and Goldenfields atop the first ridge. Over the first ridge the trail kicks back crossing exposed open fields before descending into a small drainage valley. Right as the trail turns the corner on the ridge and begins to drop there are several tiny purple Uncommon Jewelflowers, my personal favorite wildflower, they are both rare and delicate so enjoy with your eyes and do not pick them (they are an endangered species that grows only in serpentine grasslands). The train continues up the other side of the ridge where the hum of valley traffic breaks an otherwise pristine landscape. Rocky outcroppings approaching the Mine trail. The trail switches back towards the large IBM lab looming in the distance (an unwelcome intruder on the landscape, though it would appear they have taken some pains to minimize their impact on the land) before descending another drainage valley. Cows roam the hillside around here kept off the trail itself by barbed wire fencing. After arriving at the base of the drainage valley the trail follows the small creek until dead ending into the Mine trail. A left here would allow a deeper exploration of the park. 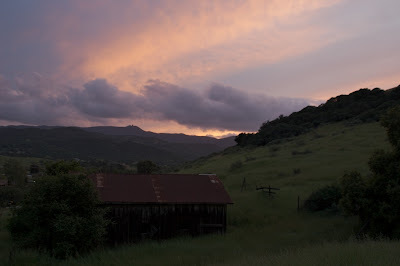 I made a right as I could see the sun was setting on the other side of the hills I had just traversed. Clouds lit by the sunset above Loma Prieta. After a quarter mile another right at the Fortini trail junction with the Mine trail begins the last leg of the trip. 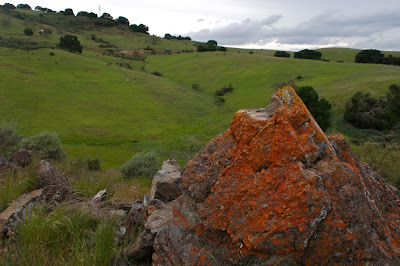 Loma Prieta appears in the distance as the trail begins to turn around the hill towards the ranches along Fortini road. A large barn marks the final turn which I had timed to coincide with the sunset. After a few hundred feet of walking along tall grasses the trail returns back on the Stile Ranch trailhead. 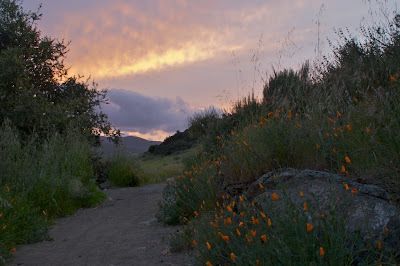 California Golden Poppies at Sunset along the Fortini tail. The Barn marks the last few hundred feet of trail before the parking lot. Tall grasses at sunset along the Fortini trail. 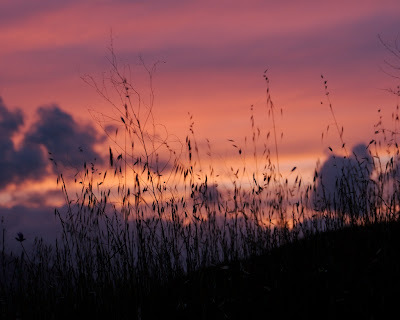 Favorite photo by far: Tall grasses at sunset along the Fortini trail. That's one of my all-time favorites too.